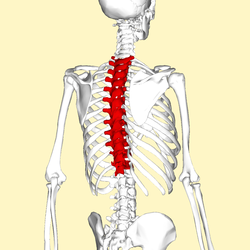 Thoracic spine usually refers to the upper and middle portion of the spinal column. It is connected to the cervical spine and then goes down to about five inches past the bottom of the shoulder blades where it then joins the lumbar spine. The thoracic spine comprises of twelve vertebrae and they are known as T1-T12. The thoracic spine is built in a way that provides stability and support and unlike the cervical as well as lumbar spine it has limited flexibility. The stability and support that thoracic column of the spine provides the body plays s key role in not only holding the body upright but also provides security and protection to vital organs in the chest region. The main distinguishing features of thoracic spine from the lumbar spine are that it has limited flexibility, thinner intervertebral disc as well as narrower spinal canal. The middle region of the spinal column is designed in an intricate maze of bones, nerves, muscles as well as connective tissues and joints. It is true that the thoracic spine is usually very stable and has a solid construction but it can be a source of discomfort in case of a thoracic spine disorder. These spinal disorders usually cause thoracic pain to the patient and if left untreated over a long period can get even worse.